Foster carers who have together devoted hundreds of years of service to some of County Durham’s most vulnerable children have been celebrated. Durham County Council has held its annual foster carers award ceremony to recognise the dedication and commitment of those who give safe, stable, loving and nurturing homes to children and young people. 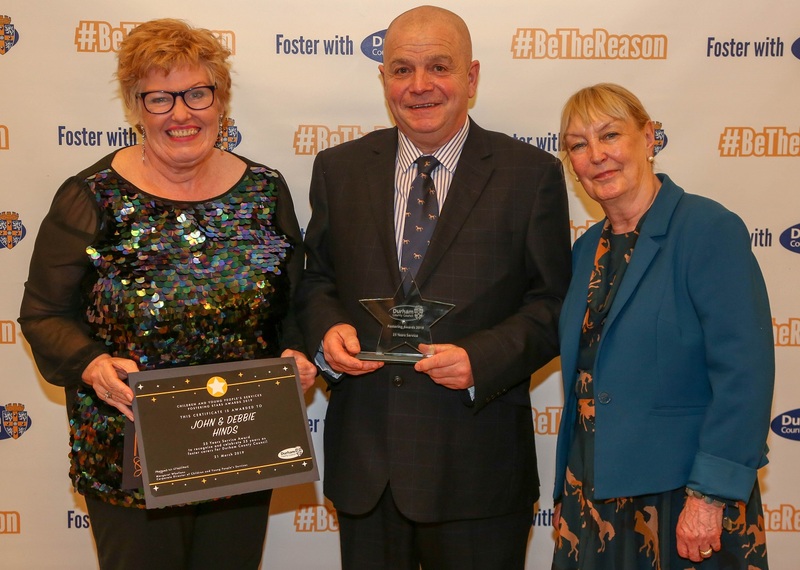 The awards acknowledged the achievements of more than 90 foster carers and their families, including long service, ranging from five years through to 25. Three families also received special recognition for going the extra mile in caring for children and young people. A further six sons and daughters of foster carers were given awards for the part they have played in welcoming children into their family and home. Awards were also given for the completion of nationally accredited training programmes. Among those to be honoured were Debbie and John Hinds from Durham, who have cared for more than 60 children in their 25 years fostering with the council. In that time, they have had many happy memories including being able to attend the Cambridge University graduation of one of the children they have cared for. John also had the privilege of ‘giving away’ his foster daughter at her wedding. Speaking after receiving her award, Debbie said she would encourage anyone who is considering becoming a carer to contact the council’s fostering team to find out more. In County Durham a new child comes into care almost every day, with 819 currently ‘looked after’ by the council. The authority is looking for people from all over the county who can offer a child a loving home and a stable family life. Cllr Olwyn Gunn, the council’s Cabinet member for children and young people’s services, said: “We are so grateful to all those who foster with us for the amazing care they provide to children across County Durham. They are special people who open their homes and their hearts. “Carers have told me how rewarding fostering has been for them and I know they go to extraordinary lengths to help children reach their potential. “We are always looking for people who can provide loving homes and care for children. In addition we need foster carers who are able to support sibling groups, older young people, and teenagers and children with a range of special needs.